Bearden was an African-American collage and watercolor artist who used his work to tell stories about black culture and the civil rights movement. He was born in 1911 in Charlotte, NC, but then moved to New York City, where his family hosted music and art salons in their Harlem home. Bearden went on to Boston University and New York University, where he began doing illustrations, including political cartoons. Bearden enlisted in the US Army, in an all-black division, but kept working on his art. In the 1940s, Bearden was part of a Harlem community of African-American artists and writers known as the “306 Group” based on the street address of his studio. He married Nanette Rohan, a dancer and choreographer, and the two lived in New York together until Bearden’s death in 1988. 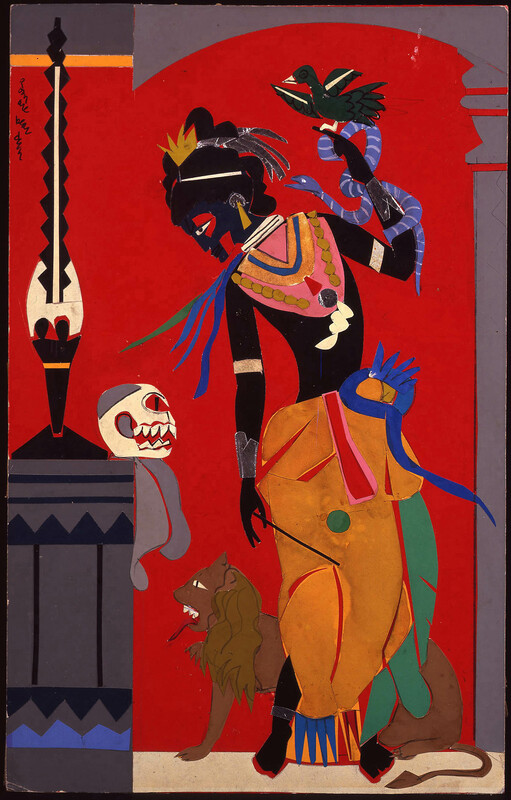 In 1977, Bearden finished a series of 20 related works — including “Circe” — that serve as a re-telling of “The Odyssey,” with characters depicted as African-Americans. The Smithsonian Institution hosted a national seven-city travelling exhibition of Bearden’s Odyssey series from 2012 to 2015. In this 15-minute video, “Romare Bearden: A Black Odyssey,” you can hear the artist’s own words about his work, and see his hands creating the pieces. You’ll also hear from experts and scholars interpreting Bearden’s work. As part of the exhibition, Dr. Robert O’Meally, professor of English and director of jazz studies at Columbia University created a playlist of music that inspired Bearden’s work. Bearden had said he made the Odyssey characters black so children from African-American communities would be interested in and understand the myth better. Art critics have speculated that Bearden’s move from North Carolina to New York spurred his interest in the archetypical Odyssean tale of going home, or, trying to find home. Bearden’s art, including sculptures and murals, appears all around the country. In this video from the San Francisco Museum of Modern Art, you can see how Bearden uses symbols such as trains, snakes and guitars in his work. In 2013, The Romare Bearden Park opened in Charlotte, NC, nearby the Mint Museum of Art, which houses the largest collection of his art open to the public. The Romare Bearden Foundation was established as a nonprofit in 1990 in New York preserving the artist’s history and legacy. The Chazen Museum of Art has "Circe" on display beginning in July 2018, in Niche 12 between Gallery 12 and 13. For details, visit their website.